ThunderGraze Extra™ is one of the most popular seed products that Ehmke Seed sells. It was specifically designed for grazing programs in the Central and Southern Plains. And after being planted on untold thousands of acres, it has clearly stood the test of time. Rye, on the left, is a very hardly plant species—and because of that, it stays greener longer into the winter than wheat. Carlyle explained that in mild winters as far north as Hays, he’s seen rye never go dormant. And here on our farm 100 miles southwest of Hays, I’ve seen it a number of times. It literally stays green and growing all winter long while wheat, for instance, planted right beside it, goes dormant and, in cases, with all the leaves burned off. So rye has earned a place in ThunderGraze Extra™, our grazing blend. The better rye varieties also produce a lot more forage than wheat. However, one of the problems with many ryes is that they tend to go out of the stand a little early in the spring. Because of that, we use several rye types like the popular Oklahoma varieties such as Elbon or Maton. But in addition, we use a European rye called ThunderGreen that is just as winter hardy but that is several weeks later. Triticale obviously is in the grazing blend for a number of reasons. Our triticales also have superior winter hardiness—but not quite to the same degree as rye but head-and-shoulders above wheat. The better triticales also produce a lot more forage than wheat—in the vicinity of about 30% more. We do not use barley because of issues with disease and winterhardiness. Our ryes and triticales fit together quite well in that while the rye comes on early in the fall and winter, our triticale compliments the rye by coming on fast in the spring as the rye is starting to slow down. Consequently, you have a grazing season with high quality forage available over a longer period of time. But not all triticale varieties are the same. There are two broad general triticale types. Tall, late season varieties generally do well in hay or silage production but are typically not the best grazers. The better grazing varieties are somewhat shorter in stature and are what I’d call medium season varieties like our ThunderCale™, which was #1 in Carlyle’s grazing evaluations. It is also the backbone of ThunderGraze Extra™, our grazing blend. One of the things that Carlyle observed was that hay and silage data don’t correlate well with performance in grazing programs. But even with the medium season varieties, there’s a lot of difference. Are all wheat varieties the same? Absolutely not. With wheats, it’s very common to see a 10 to 15-bushel yield spread between the top and bottom. In the same regard, there are some really good grazing types like ThunderCale™ and ThunderCale V™. And on the bottom end, some triticale varieties are no better than wheat. However, we do have a small amount of wheat in our grazing blend because wheat can make a contribution to forage quality. And finally, we have a small amount of spring triticale in our grazing blend. If you ask cattlemen what’s most important to them, near the top of the list is fall forage production. Of course, date of planting has a lot to do with that—plant early and you get more forage. And you can do this with rye and triticale without the risk of running into diseases like wheat streak mosaic. In addition, though, Carlyle explained that there are many ways of skinning cats. And another very innovative way to boost fall forage production is to add in a small amount of spring triticale. At first I thought that wasn’t real smart because it’ll probably winterkill. And in an extremely high percentage of cases, that’s exactly what happens. But then I looked at his data and saw what he was talking about. 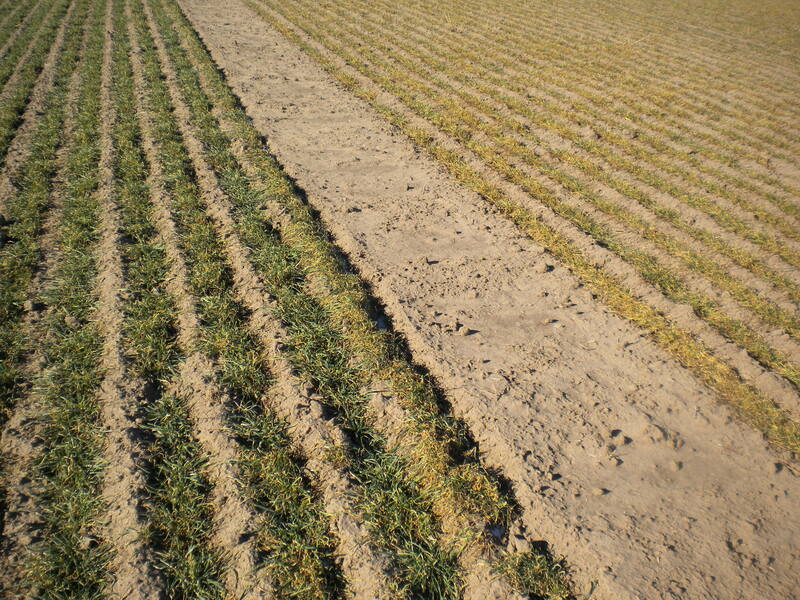 During the time that it’s alive, spring triticale planted in the fall will produce twice as much forage as anything else you could plant—winter wheat, winter rye or winter triticale. The bottom line is ThunderGraze Extra™—a blend that fits together well and has the cattle performance to prove it!